A man is to stand trial accused of murdering a man by hitting with him a hammer and stamping on his body in his Glasgow home. 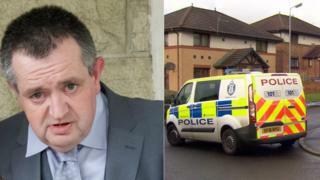 James Brennan, 57, is accused of killing John Cameron, 46, in the city's Castlemilk area on 16 February. He is also alleged to have assaulted Marissa Murphy to the danger of her life by striking her with a hammer. Mr Brennan denies the charges against him. A trial date was set for September at the High Court in Edinburgh. Appearing in the dock at the High Court in Glasgow, Brennan was also charged with stealing a quantity of controlled drugs and a sum of money from Mr Cameron's home in Stonebank Grove, on 16 February. Mr Brennan is also accused of attempting to defeat the ends of justice by telling Ms Murphy he would kill her and her children if she said anything to the authorities, and disposing of clothing and footwear. He faces further charges of being concerned in the supply of heroin on 16 and 17 February, and being in possession of heroin. The trial is expected to last 10 to 12 days.